On this episode of DTB’s “Bus Invaders”, we take you inside the touring vehicle of the heavy metal band, Trivium, while on tour with Arch Enemy, While She Sleeps and Fit For An Autopsy. Trivium is best known for their songs “Until The World Goes Cold” and “Strife”. 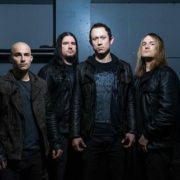 Trivium Announces “Silence in the Snow Tour” for U.S.